They are the Free Air Carbon Dioxide Enrichment (FACE) Station and Carbon Dioxide Open Roof Greenhouse set up with the collaboration of the Sime Darby Foundation (SDF). 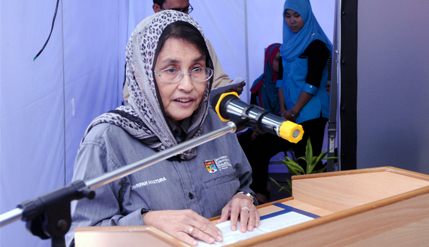 IKLIM Director Prof Dato’ Dr Sharifah Mastura Syed Abdullah said FACE is a method and facility to enrich the atmosphere around parts of a land ecosystem with controlled amounts of carbon dioxide, or other gases, without using enclosures or walls. She said the project is a long term monitoring programme with the main objectives of determining the impact of free CO2 from the air on forest habitats. Without FACE, data about plant and ecosystem responses to rising carbon dioxide (CO2) concentration came from studies in laboratories where the conditions were modified by the enclosures. The study includes changes in soil acidification, plant composition, soil microbes and plant physiology. The other facility, the CO2 open roof greenhouse is aimed at providing experiments on response of plants on elevated concentration of CO2. Several studies have been carried out on various types of plants that include mangroves and terrestrial vegetation to examine what happens to them when exposed to high concentrations of CO2. The greenhouse has plant growth chambers with automated CO2 injection systems. The chambers also control environmental conditions such as temperature and humidity. They are installed at the Faculty of Science and Technology. The two facilities were unveiled in a ceremony by the non-Independent Non-Executive Director of Sime Darby Berhad and SDF Tan Sri Dato’ Dr Wan Mohd Zahid Wan Noordin,. Tan Sri Wan Zahid praised UKM for the two pioneering projects saying the programme will be a major factor in raising awareness of climate change issues among the public and in helping with the design and implementation of policies and strategies for sustainable development. He said IKLIM and its director Prof Sharifah Mastura have helped create a wide range of opportunities for collaborative research to support the collection and consolidation of information designed to meet needs of decision-makers in climate-sensitive sectors. The UKM-YSD Chair for Climate Change, which is held by Prof Sharifah Mastura, was established to address climate change, the world’s most important environmental problem facing humanity. The programme is managed by UKM’s IKLIM in consultation with YSD. The chair is intended to provide a platform and leadership for coordinated efforts and resources in climate research and related issues, particularly for the South East Asia region. It allows IKLIM to spearhead research aimed at assessing the impact of climate change in Malaysia and deepening understanding of the scientific aspects of climate change with a view to identifying mitigation measures and adaptation strategies. Tan Sri Wan Zahid said through its funding of RM5 million for the activities of the academic chair, YSD is allowing UKM to take on a leading role in climate research focusing on the effects of climate change on water resources, the terrestrial ecosystem and health of people, marine eco-systems and sectors such as fisheries, as well as agriculture in Malaysia and South East Asia. At the opening ceremony research groups using FACE and the Greenhouse were persented mock cheques of the grants that they recieved to carry out the studies.